R.C. Sproul has for many decades proclaimed and defended the resurrection of Jesus Christ. As the founder and president of Ligonier Ministries, his teaching can be heard worldwide on the program Renewing Your Mind, which is available on 230 radio outlets in the United States and in fifty countries worldwide. Dr. Sproul also serves as the senior minister of preaching and teaching at Saint Andrew’s Chapel in Sanford, Fla., and he is the author of over sixty books including his most recent publications, The Prince’s Poison Cup, The Truth of the Cross, and Truths We Confess. 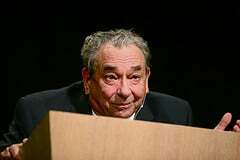 Dr. Sproul’s message was entitled Witnesses of the Resurrection — The Apostolic Message. He read I Corinthians 15:12-32. In 1965 we had our first son (our daughter was three years old). My mother was very happy. She had just received the dress she would be wearing to my ordination ceremony (scheduled to occur 10 days later). We talked that night, and then she went to sleep. That night she died in her sleep. I had spoken to her within 8 hours of the moment that I discovered her dead. While Alistair was speaking, he said that the resurrection is rational. It struck me that death is irrational. Wherever we look at human culture we see this hope for the continuity of life — a hope that refuses to be extinguished from the human heart. But as the Bible says, without Christ we are really without hope. There were those in the Christian community in Corinth who were saying that there was no such thing as the resurrection. So Paul is responding to them in this letter. Paul was extremely well educated; he had the equivalence of two Ph.D.s by the age of 21. But Paul understood that logic was shared by all humanity. And the human mind was created by God to be rationale, not chaotic. Sometimes we think that Aristotle invented logic. He didn’t. Aristotle discovered the laws of logic. And here Paul argues to the Corinthians in an extremely logical manner. The ad hominem abusive fallacy is when you attack the person. But there is a legitimate form of ad hominem argument, and that’s what Paul does here in I Corinthians 15. That is when you step into the shoes of your opportunity and say: “OK, let’s assume what you are saying is true. And let’s take it to the logical conclusion.” In this manner, Paul reduces his opponent’s argument to absurdity. If we say “all men are mortal.” And “this man is not mortal” — that’s a contradiction. You can’t have a universal negative and a particular affirmative. “If there is no resurrection of the dead, then not even Christ has been raised” (I Cor. 15:13). And if that’s the case, our preaching is in vain. Every moment that I’ve spent in the pulpit has been a herculean waste of time. And not only has my preaching been in vain, but your faith is in vain. Hear the preacher of Ecclesiastes: “Vanity of vanities, all is vanity.” The vanity here is futility. Jean Paul Sartre wrote a book called Nausea. He argued that man is “useless passion.” What a way to describe a human being. We all have passions. A loved one dies; we weep. But Sartre says it is a “useless passion.” There is no way to make any sense of it at all. And our culture has been drowning in this sort of atheistic nihilism for decades. Jean Paul Sartre, Nietzsche, and Albert Camus — these folks had no time for the silliness of humanism. The humanist wants to exalt the dignity of a grown-up germ who (ultimately) has no meaning (according to the humanist). The humanist thus lives on borrowed capital; he (as Francis Schaeffer said) has “both feet planted firmly in mid air.” Human dignity has no basis in a humanistic worldview, but it has a firm basis in a Christian worldview. Moreover, we are found to be Jehovah’s false witnesses. Why? Because we’re telling people that God has raised Jesus. But if the dead are not raised, then God has not raised Jesus. For if the dead are not raised, not even Jesus was been raised. And your faith is futile. And you are still in your sins. That’s not all. Those who have died have perished — fully and finally. Your funeral services are hoaxes. All those you know and love who have died — they are gone. Forever. They have perished. And if in Christ we have hope in this life only then we are of all people the most to be pitied. But if the only reason for believing in the resurrection was so that we can have something nice to hang on to, then Christianity is a chapter in Alice in Wonderland. Christianity is not a pain killer. If Christ is not raised, I’m going to sleep in tomorrow. I’m not going to spend my life preaching and teaching the things of God. Paul is saying: “I want you to understand what is at stake here. I want to disavow you of any compromise, like humanism.” In verse 20 Paul says that Christ has in fact been raised from the dead. How would your life change if you knew with absolute certainty that Jesus had risen from the dead? What if it came to you from an infallible source? That’s the testimony we have — the word of God. The only infallible rule of faith and practice. No syllogism or formal demonstration could exceed the certitude of the affirmation of the infallible word of God. Remember that Jesus prayed in John 17 that God would sanctify His people in the truth — Your Word, O God, is truth. I grew up in a liberal church. One minister said the meaning of Easter was to give us courage each day. Another minister said when you’re dead, you’re dead. But in 1957 on the way to a bar a football player told me about Jesus. And he spoke of Jesus as if He was actually alive. And more than anything in the world, I wanted what he had. That night I met the living Christ. That Christ has risen from the dead makes all the difference in the world. It means our suffering is not in vain. Our cancer is not in vain. Every tear, every labor, counts forever.